"Ludvigsen's engineering background and longstanding interest in engines really come through in the way he unerringly focuses on the main details and innovations of each powerplant, along with the technical shortcomings that were obstacles to the engine's success"
From the earliest days of motor racing, engineers have sought to develop engines that push the boundaries of technology. In Classic Racing Engines, Karl Ludvigsen, award-winning automotive historian and author of The V12 Engine, takes a deep dive into the design, development and performance milestones of 50 of the most innovative and ground-breaking classic racing engines from 1913 to 1994. The 50 engines covered are wonderfully elucidated with photographs, technical drawings and specification tables as well as Ludvigsen's own expert analysis of what makes them noteworthy. 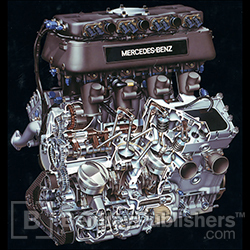 The author draws upon his extensive network of contacts throughout the racing engine world to provide behind-the-scene stories of the cutting-edge technology and colorful personalities involved in developing these historic power units. 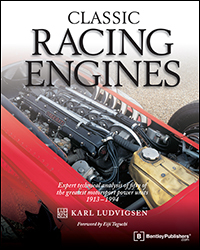 Karl Ludvigsen's chronological exploration of these 50 landmark engines in Classic Racing Engines provides the perfect foundation for understanding and appreciating the record breakers of today.